Posted February 26th, 2013 by Kolos Molnar. 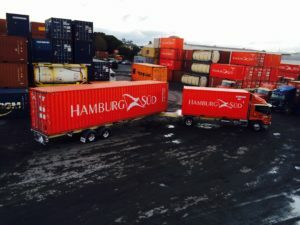 We are a fourth-generation family business that has provided logistics services to New Zealand’s manufacturers for nearly 100 years. 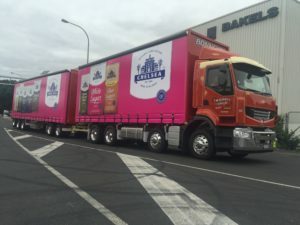 Working for some of New Zealand’s biggest and smallest companies – our team delivers their ingredients, packaging and end products to the next step in their supply chain. Our specialised transport solutions ensure that our customers operations run smoothly to ensure that their ingredients are delivered on time and in pristine condition. We understand that this business critical. 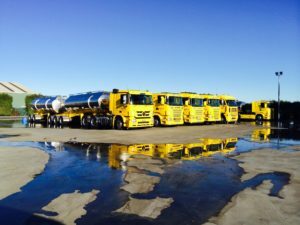 What stands us apart is our commitment to safety, service and attention to detail – this is reflected in our fleet prime movers, trailer units, tankers, curtainsiders and containers. We pride ourselves on our positive relationship with New Zealanders. • Lyle Bonney, the founder of the company, started off his working life in the early 1920s delivering groceries by horse and cart around Titirangi, Auckland. • Sons Alven and Selwyn were born in 1926 and 1933 respectively. • In the late 1920s Lyle purchased a Ford Model T, which he used to collect 56lb blocks of butter which his wife, Rita Bonney, and his mother-in-law, would cut up into one-pound blocks of butter which he would then deliver to grocery shops in West Auckland. • In addition, Lyle ran a taxi in Auckland, and the family ran a chicken farm, which he then sold in about 1946. • During the war Alven completed a five-year mechanics apprenticeship at Schofields, Newmarket. • In 1946 Lyle and Alven went into business together forming L.W. 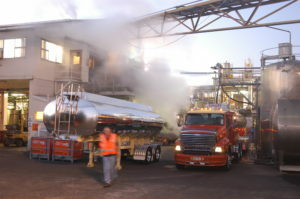 Bonney and Son Limited delivering milk to the East Tamaki Dairy Company and the Auckland Milk Corporation and operating the Runciman Service Station south of Auckland. 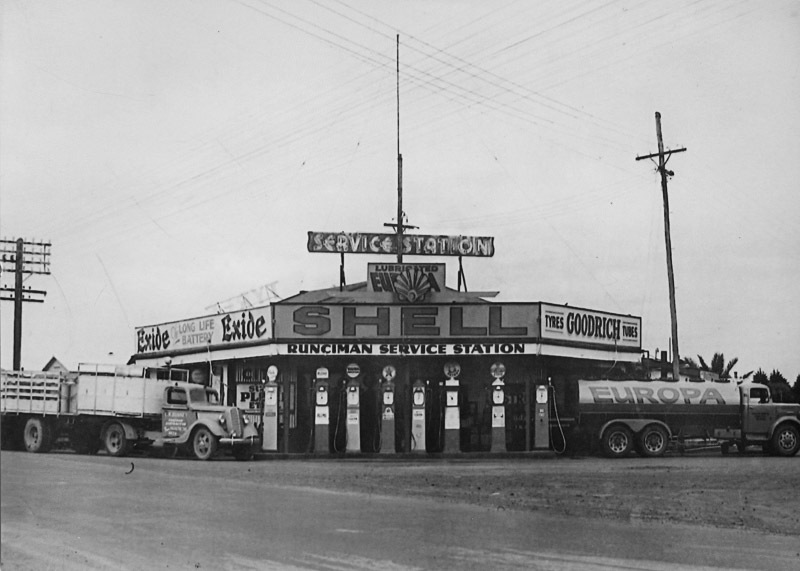 • During this time a standard day would consist of 5am local farm pickups and deliveries to Drury, East Tamaki and later Manukau Road, back to Runicman to operate the service station, before the evening milk round that started at 5pm. In those days a milk round required the manual handling of 100, 20-gallon milk cans on and off the truck. • In 1949 Alven married Maddelanne Beaton de Malmanche – Dell. They had met while Alven was picking up milk from her family farm in Papakura. Children Calven, Leigh and Joanne then followed being born in 1951, 1956 and 1964. 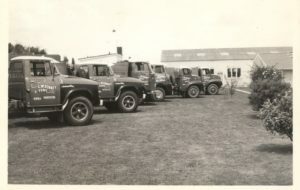 • In 1953 the Family moved North from Papakura to new Papatoetoe which brought opportunities for land development and to expand the fleet into coal cartage. • The first depot was in Butler Ave where the family also lived before purchasing part of the Grange Golf Course including the old homestead in 1957. • Selwyn, by then a sign writer, joined the business in 1954 and the business became known as L.W. Bonney and Sons Limited. • Before developing the land into a depot fronted by family homes from 55 – 59 Great South Road Lyle and Rita, along with Alven’s family along lived in the old homestead. • Once the development was complete Lyle and Rita’s home, number 55 doubled as the business’ depot and office. 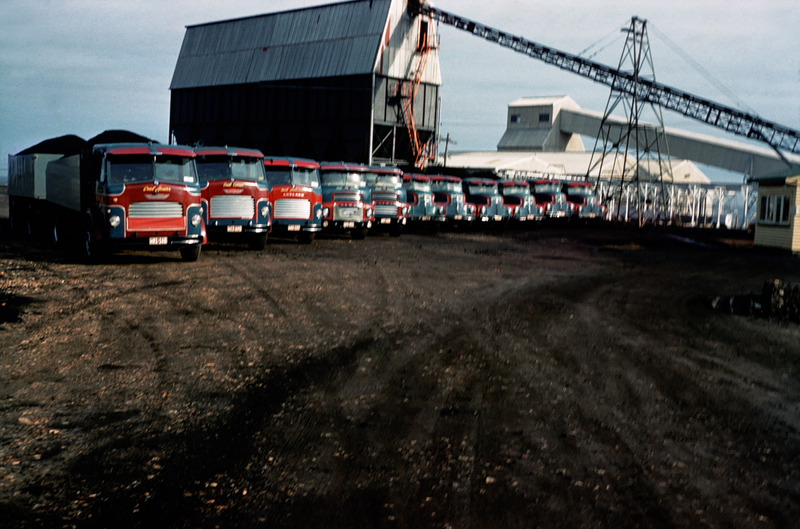 • The depot housed a fleet of Commers, Leylands and then Mercedes Benz’ that peaked at 26 tip trucks in the 1950s carting coal from Kopuku, Huntly and Mercer to Holeproof Mills, Auckland Laundry, East Tamaki Dairy Company, Reidrubber, Auckland Milk Treatment and various market gardeners. • The business expanded and was a large enterprise for its time carting sand, coal and aggregate – it was post war and there was a strong emphasis on building Auckland’s infrastructure. Drivers were part of the family, they stayed for the long run with many also being helped into their own businesses. 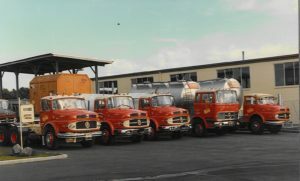 • An innovator in the industry, Bonney’s became the first transport company in Auckland to cart bulk products when in 1960s they began carting bulk flour in tankers – quite a change from 72kg bags. 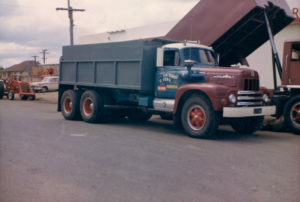 • In 1966 Bonney’s sold coal trucks to their then driver Neil Otway who founded Coal Lines Transport and later formed Trans Otway in Auckland and Bruce and Ian Hall of I&B Hall in Mangatangi. 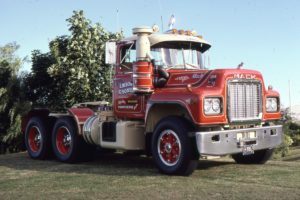 • From 1970 – 73 Calven served his time as a fitter and turner at Mayo and Sons, once complete he left to do a three-month International Vintage Car Rally around the South Island. 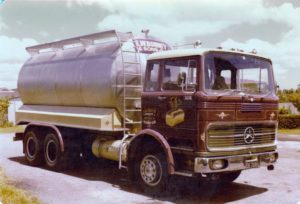 • On his return home he jumped straight into a Bonney’s TK Bedford before being promoted to a Mercedes Benz semi and trailer carting sand and coal for the next year. • Calven met 1973 he met Ann Rambaud, a nurse from Papatoetoe whose father also owned trucks. They met after a truck vs car on the corner of the Great South Road and Church St, just a stone’s throw away from the current Bonney’s yard. • Married in 1975 they have three children Pamela, Travers and Stephanie all born in quick succession between 1978 and 1982. 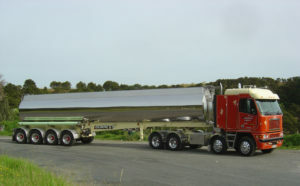 • Keen to make his own way Calven formed CD Bonney Ltd in 1973, purchasing his first truck – a four-cylinder two stroke 1952 Foden to cart phosphate off the Ports of Auckland to fertiliser companied in the Waikato. 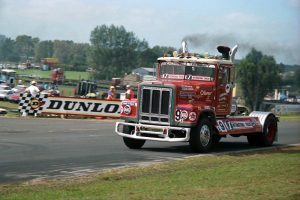 The same year he replaced the Foden for a 1966 Mercedes 1418. 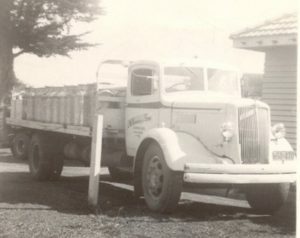 • From there in partnership with Bonney’s he won the business to cart bulk grain and bagged flour for Bycroft’s and Champion. 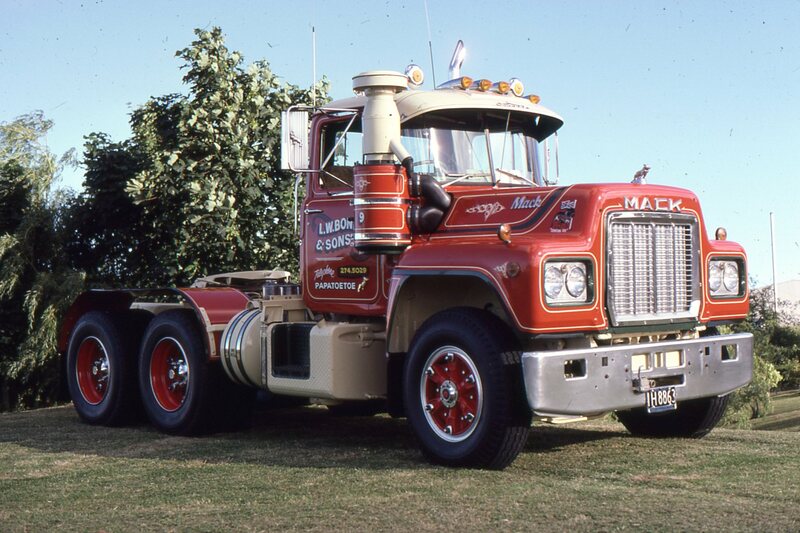 By 1974 his fleet had expanded to three trucks with the addition of a second 1418 Merc and a K Series Ford. • In 1974 Calven was elected to the Board of the National Road Carriers and remains on it today. • Lyle Bonney passed away in 1974 and Rita, Alven and Selwyn continued to run the business. 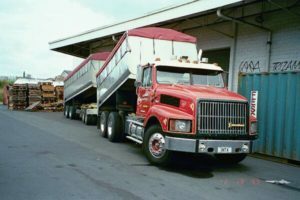 • In 1980 Altranz acquired the CD Bonney and LW Bonney & Sons flour fleets, leaving Calven to try his hand at a few different things including a sun visor and truck accessory business and helping his old friend Alan Lewis build up his business Alert Engineering. • Then in 1984, on a chance visit to the Bonney’s yard he left owning the family business. Buying it from his father and Uncle Selwyn who had decided that it was time to retire. 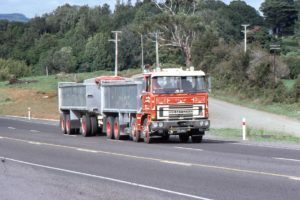 • There were three trucks – a Mack semi and trailer, a TM Bedford 8-wheeler with a three-axle trailer and an International six-wheeler and three-axle trailer, based East Tamaki still carting coal, sand and aggregate. 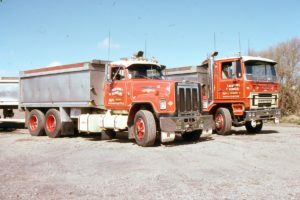 • On day one Calven added a fourth truck an International Paystar to the fleet, which in later years became one of New Zealand’s first race trucks. • Naturally entrepreneurial Calven, worked day and night to build the business and took advantage of the changing industry landscape. 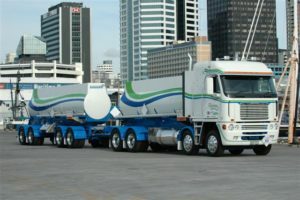 • Innovation had always been a key differentiator for Bonney’s they were the first to put flour into tankers in 1964 and they would now be first to put sugar into pneumatic tankers in the 1980s. 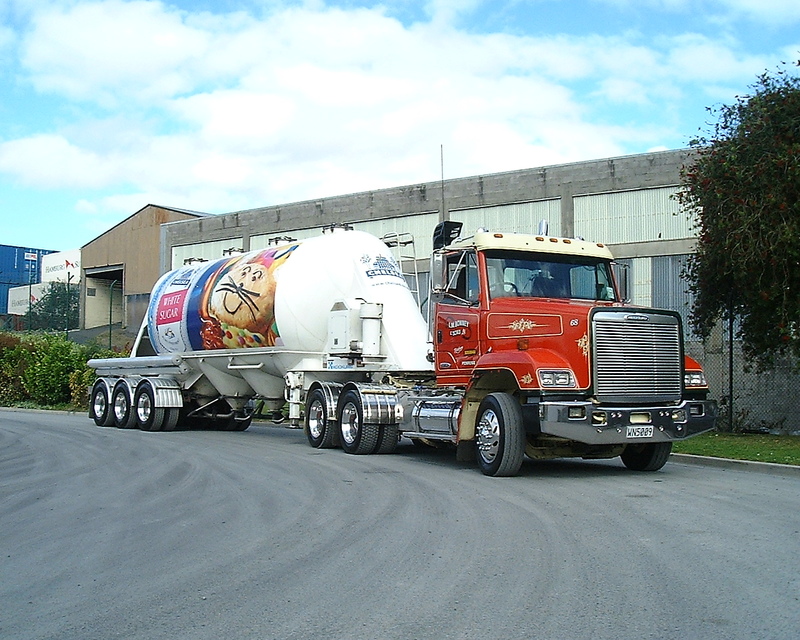 • A run of acquisitions that included the NZ Express tanker division, expansion into containers through Bruce Casey, JS Callinan and Tom Ryan, growing our milk and wine business with the acquisition of Shuttle and Alexander’s wine fleet. 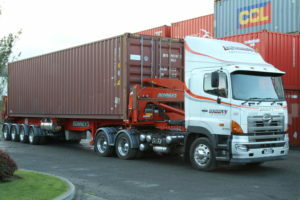 This saw the Bonney’s fleet grow to around 125 trucks with depots in Auckland, the Waikato and Blenheim. • Known for having one of the best cared for fleets, it reflects the Bonney’s culture of safety, service, pride, care and attention to detail. • Today the company provides specialised bulk transport services to its customers, delivering raw ingredients to their factories and then delivering the final product – most importantly making sure that their customers’ supply chains keep on moving. • Today Bonney’s employees around 150 people around New Zealand, many of them are long-term employees some having been with the company for 30 years plus. As a specialised transport operator we have a large and varied fleet that can offer a varied work experience for anyone wanting to work in the road transport industry. 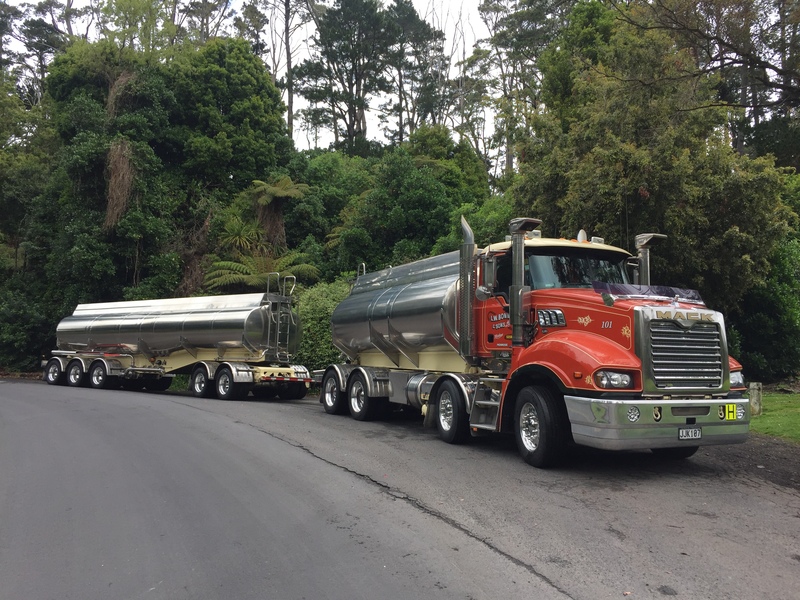 • Calven’s commitment to the industry was recognised in 2018 when he was made a Member of the New Zealand order of Merit for his services to transport and motorsport and then inducted into the NZ Road Transport Hall of Fame. 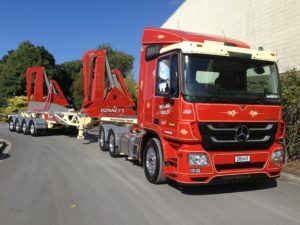 • As an advocate for the trucking industry in New Zealand for more than 40 years, alongside his business interests, he has served as a Director and President of the National Road Carriers Association, and as a Director and Chair of the Road Transport Forum New Zealand. He has been recognised by both organisations with life membership. Calven bought the family firm, L.W. Bonney and Sons Ltd, in 1984. Calven was a founder of the Road Transport Forum and has been a board member since its inception. He was the Road Transport Forum Chairman from 2000 to 2002. He has been on the executive committee of National Road Carriers since 1974 and is a past president. Calven was made a Member of the New Zealand Order of Merit in 2017 in recognition of his contribution to the trucking industry and motorsport. 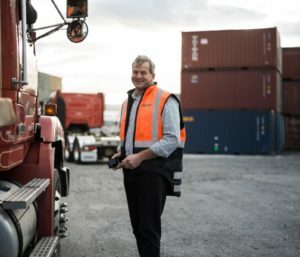 While completing his Bachelor of Commerce in Management and Operations Management at The University of Auckland Travers worked in various roles at Bonneys, including as storeman, washbay attendant and truck driver, before implementing a workplace safety management programme. Travers has worked at Bonneys in operations full time since 2006. During this time he completed a a Post Graduate Diploma in Business Administration, graduating in 2009. 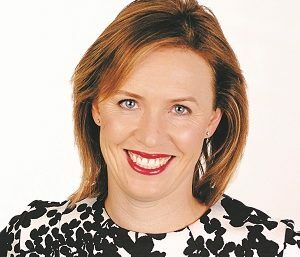 Since 1999 Pamela has worked at senior levels for Hewlett Packard in New Zealand, Europe, Middle East and Africa and at headquarters in the US; global PR agency Hill in Knowlton in London, Baldwin Boyle Group, Fonterra and Suncorp in New Zealand. Pamela’s focus at Bonney’s is Customer Experience – delivering the right customer experience whilst optimising business operations. Pamela provides strategic change counsel to private enterprise through her company Bonney and Co. and is a trustee for the Motu Foundation. 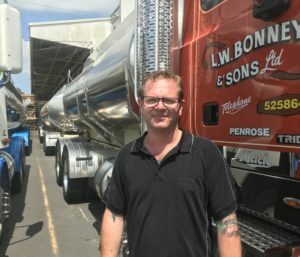 Mike joined Bonney’s in 1993 starting off in the washbay, before being quickly promoted to a driving job firstly on a swinglift before progressing on to tankers and linehaul work. In 2011 Mike took over as Fleet Manager, overseeing the Bonney’s workshop, washbay and fleet. Mike is a qualified diesel mechanic. Tim Wilcock joined Bonney’s in 2009. Tim has more than 25 years in the transport industry with broad experience across all facets of the industry from freight forwarding and warehouse management through to line haul and specialised bulk liquids. Tim got his start in the industry in the late ‘80s and early 90’s as an owner driver for Ivory Freight and Kevey’s before moving into operations management. Prior to joining the transport industry Tim was a dairy farmer. At Bonney’s we actively support the following industry associations. Calven was a founding member of the Road Transport Association in 1992, and has been a Board Member at National Road Carriers since 1974. Recognised for his contributions to transport in 2018 Calven believes in driving change within the heavy transport industry to serve the greater good. Calven got involved in motorsport 50 years ago during his apprenticeship at Mayo & Sons when he got to crew for Jack Brabham, Denny Hulme, Kevin Bartlett, Frank Gardner and Max Stewart. He went on to drive John Cann’s sprint car at Western Springs in the ‘70s. Staying there through the ‘80s racing TQ’s and midgets he developed a crowd-pleasing style and love for the reverse grid. In 1984 when Calven and wife Ann bought the family transport business Calven stepped away from racing. In 1989 Trevor Woolston and Calven brought Truck Racing to our shores. Taking a 1974 International Paystar off the road to race. He then went on to drive Denny Hulme’s Scania owned by Don Wright and McGinty’s Kenworth. In 2005 Calven finished a custom built 2002 Monaro, with a 7 litre rodec and a six speed Hollinger. Racing in the SuperGT series the car flew and held the lap record at Pukekohe in 2007 – equalling supercar times on the day. For a few seasons Calven raced the truck and Monaro at the same meetings. 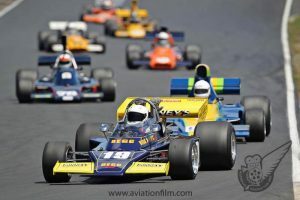 The opportunity to race Neil McCudden’s Formula 2 at Phillip Island got Calven hooked on open wheelers and in 2009 he purchased the Begg 018 F5000, restored it and was ready to race in the 2010 season. He last raced the Begg in the 2016-17 Tasman Revival Series before selling it to Scott O’Donnell. In 2016 he raced with Steve Doughty in his Holden NZV8 in the Mahindra 3-hour Endurance Series.